Help These Handicapped Cats by Building Them a “MeowHaus” to Live In! As if it weren't hard enough being a homeless cat, imagine being handicapped too? Many felines suffer from a very uncat-like condition called Cerebellar Hypoplasia (CH), which is a debilitating disorder that causes them to lose their balance and fall with even the slightest surface change. 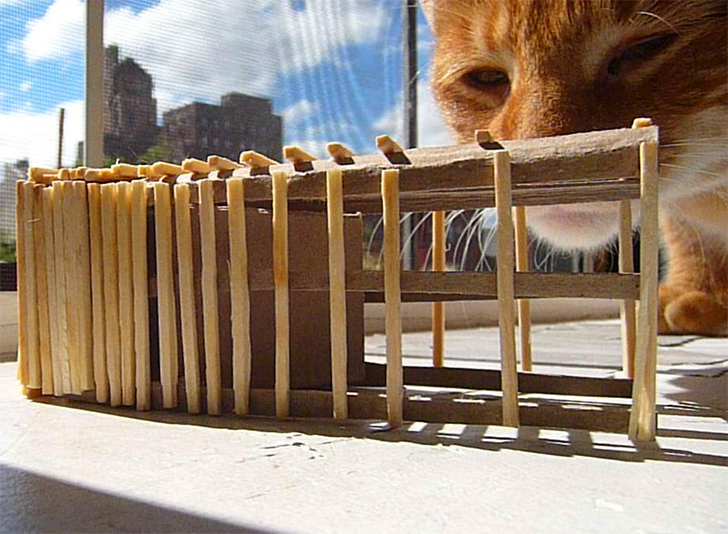 To give some of these furry friends a safe, stable place to call home, an enterprising group of students from the Spitzer School of Architecture of CUNY CCNY has started the Meowhaus Project. They're currently building the MeowHaus, a tiny 12' x 20' ft structure out of reclaimed materials in the CATskills (no joke), but they need your help. The MeowHaus was designed by an industrial and compassionate team of college students made up of Todd Hansmann, Michael Luft-Weissberg, Michele Flournoy, Claire Ross, Tiffany Kimmel, Mike Fiorelli, Nick Okcacek, and Becca Dorff. As you can see from the photos in our gallery, the team has already begun to build MeowHaus but they need support to finish it. If you’re interested in helping financially, they’ve launched an IndieGoGo campaign and they need about $1,000 to reach their goal. Or if you’d rather lend your brawn to the project, they’re also looking for construction volunteers in the area. We’re already fans of the MeowHaus because of its humanitarian purpose, but the sustainable manner in which it’s being built is another merit that deserves mention. The design incorporates locally-sourced recycled materials such as old windows, doors, siding and roofing and over 100 wood shipping pallets from nearby stores. The pallets create an exterior shell that also acts as a sun screen around the interior core building, and do triple duty as a source of fun shadows for the cats inside to play with throughout the day. When it’s completed (hopefully with your help) MeowHaus will be home to 10 amazing kitties that can enjoy its individual cat cubbies, litter area, feeding area and outdoor area that they can visit as they please. If you’re a cat lover or just want to help these cool kids bring their design-build project to fruition, please donate today! There are a number of nice perks available for those who support the cause and the animals you help will definitely think you’re the cat’s meow. Help These Handicapped Cats by Building Them a "MeowHaus" to Live In! The MeowHaus was designed by an industrial and compassionate team of college students made up of Todd Hansmann, Michael Luft-Weissberg, Michele Flournoy, Claire Ross, Tiffany Kimmel, Mike Fiorelli, Nick Okcacek, and Becca Dorff. As you can see from the photos in our gallery, the team has already begun to build MeowHaus but they need support to finish it. If you're interested in helping financially, they've launched an IndieGoGo campaign and they need about $1,000 to reach their goal. Or if you'd rather lend your brawn to the project, they're also looking for construction volunteers in the area. We're already fans of the MeowHaus because of its humanitarian purpose, but the sustainable manner in which it's being built is another merit that deserves mention. The design incorporates locally-sourced recycled materials such as old windows, doors, siding and roofing and over 100 wood shipping pallets from nearby stores. The pallets create an exterior shell that also acts as a sun screen around the interior core building, and do triple duty as a source of fun shadows for the cats inside to play with throughout the day. When it's completed (hopefully with your help) MeowHaus will be home to 10 amazing kitties that can enjoy its individual cat cubbies, litter area, feeding area and outdoor area that they can visit as they please. If you're a cat lover or just want to help these cool kids bring their design-build project to fruition, please donate today! There are a number of nice perks available for those who support the cause and the animals you help will definitely think you're the cat's meow.